On 9 July 2015, Christie’s London is offering a spectacular Luba bowstand from D.R. 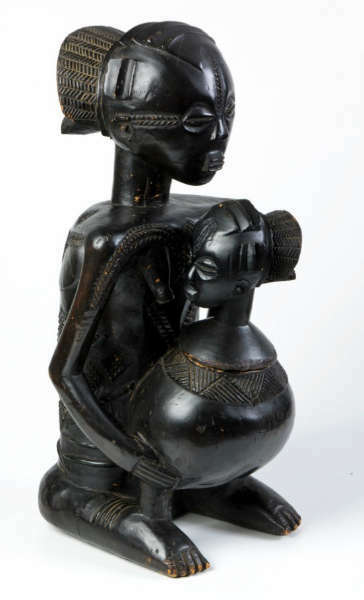 Congo attributed to the Warua Master. 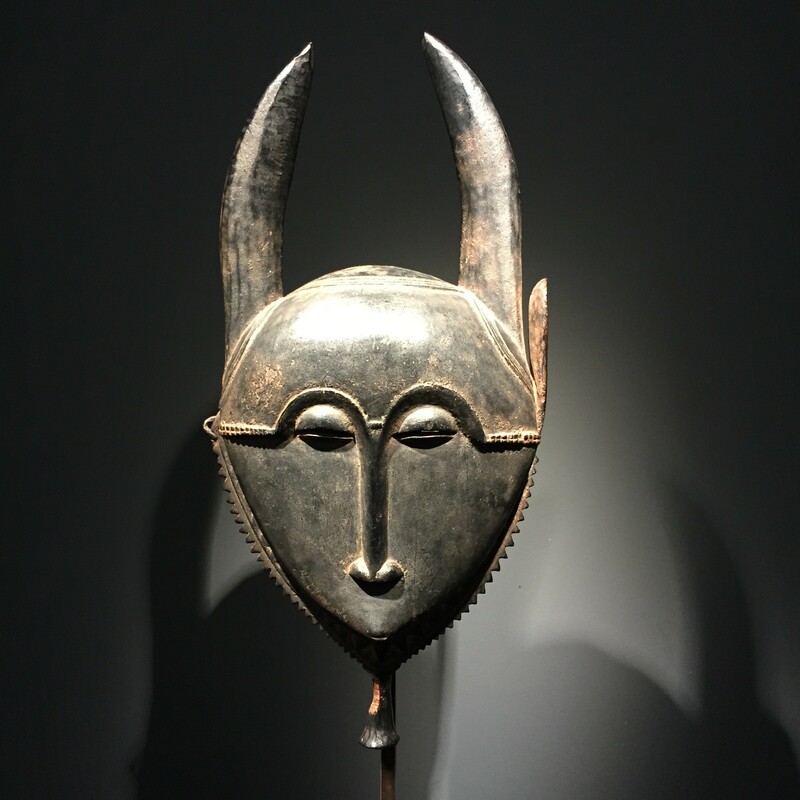 It will be included in a special auction called “The Exceptional Sale” (info) – bringing a selection of decorative arts, and two important African art objects as well. To have another work by this artist on the market only two months after Sotheby’s NY sold a male statue by this artist (info) is exceptional. That figure was sold for $ 3,6 million (est. $ 3-5 million), the bowstand (by many considered the reference object of this artist and with an even more impressive provenance and publication and exhibition history) is estimated at $ 2,4 – 3,9 million. This anonymous sculptor has been assigned various conventional names which I list here in chronological order: The Frobenius 1904 Warua Master by Susan Vogel in 1986, the Warua Master by Ezio Bassani in 1990, The Master of the Court of Sopola by François Neyt in 1993 and again the Warua Master by Heinrich Schweizer in 2015. I had suggested in my 2001 catalogue the name Kunda Master, a denomination used subsequently by Petridis in his publication. The Kunda were one of the most important and ancient royal clans of the Eastern Luba, which produced such amazing talent as the Kateba workshop (also know as the Buli Master) and the great Boyo art styles. 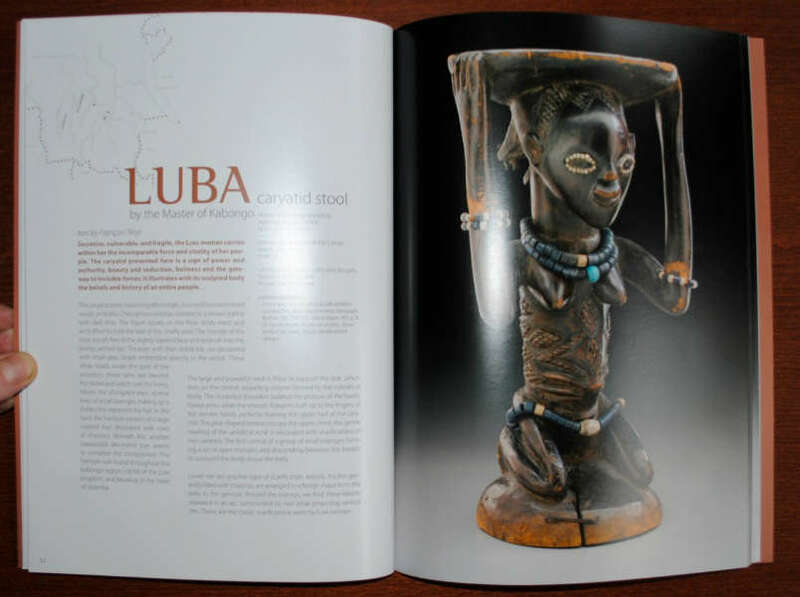 The highest concentration of geographical provenance of works by this sculptor are found on both sides of the Luvua River, at the crossroads of Luba, Hemba, Tabwa and Boyo art styles. Of the nine works by this Master, we have the exact geographical origin for one piece, the bowstand from an American Private Collection. 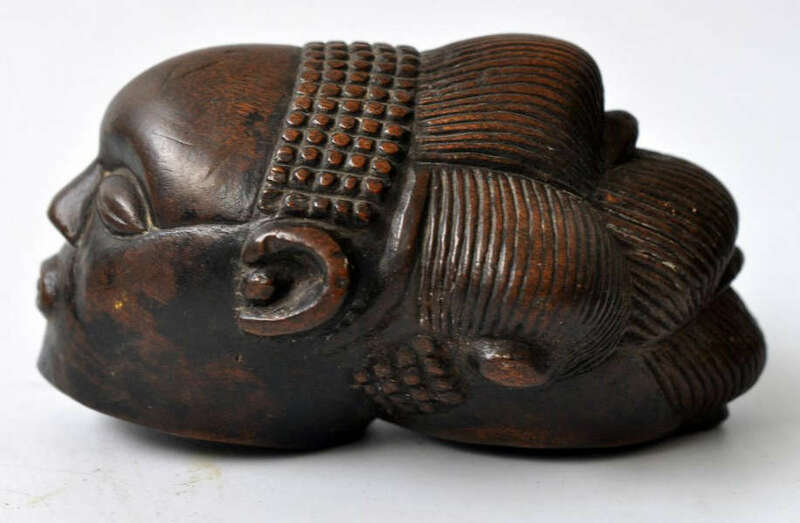 It was given to the private collector by Chief Kahulu Ngoy in the village of Kishiale near Piana-Mwanga, the capital of the Batempo Chiefdom, not far from Kiambi. According to Maesen, the Tervuren figure was also collected between 1902 and 1903 not far from Kiambi by Rusmont in the village of Pweto, on the north bank of the Luvua River. The statue from my father’s collection was found in a village near Kiambi according to Dartevelle. Three works of this artist being collected near this river, the Luvua Master could be considered a proper pseudo-name. 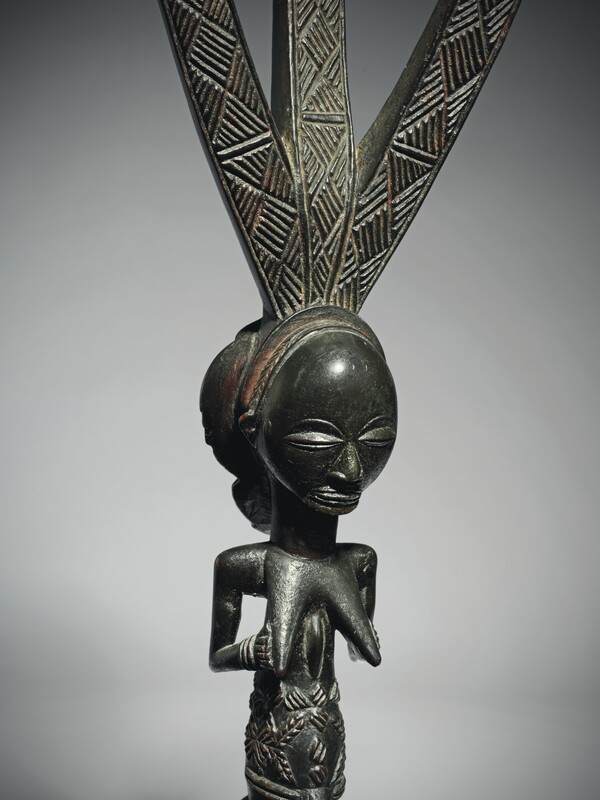 The name (The Warua Master) was chosen in reference to a male-female janus-figure in the Ethnologisches Museum, Berlin (inv. no. 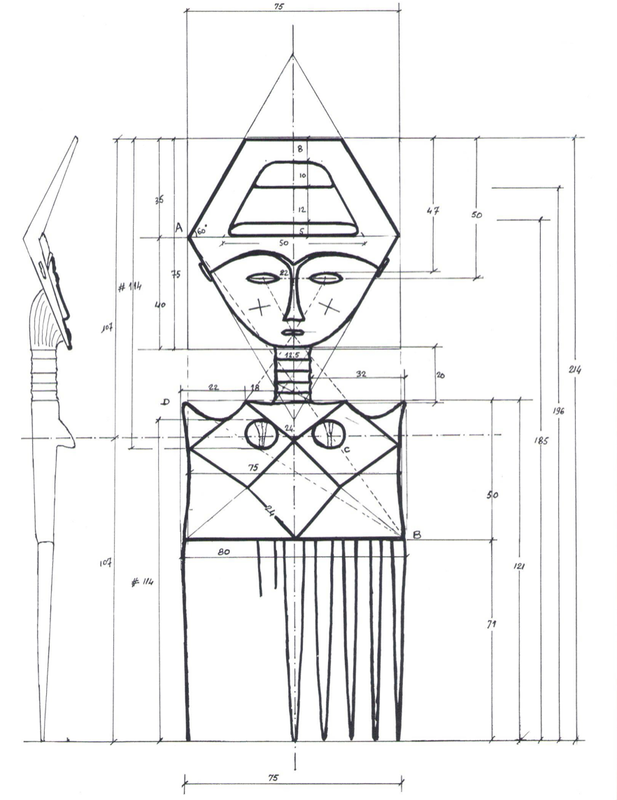 “III.C.19996”) which was collected by the German ethnographer Leo Frobenius in 1904 and labeled by him as “Warua”. While the name has been criticized as too vague and non-descriptive (“Warua” is the Arabic pronunciation of “Baluba”, i.e., “the Luba people”, and was widely used at the time for both the inhabitants as well as the territory west of Lake Tanganyika and north of Lake Moero), none of the other suggested names of convenience convince as they are either just as vague and non-descriptive, or not sufficiently supportable by evidence. However, as the information gathered by Bernard de Grunne shows, a shift from Warua Master to Luvua Master would more precisely reflect the known geographical distribution of three of his works. But as he himself states, it remains to be seen if this will be accepted in future publications. Note that Christie’s is still using ‘The Warua Master’ for the time being. Image courtesy of Bernard de Grunne. Statuette, M.R.A.C., Tervuren inv. N° 26633, collected by Rusmont between 1902 and 1903,7 (above, far right). Janus statuette, Berlin Museum für Völkerkunde, inv. N° III C 1996, purchased by Leo Frobenius from Hamburg dealer J.M.G. Umlauff and sold to the Berlin Museum in 1904,8 (above, one from right). Bowstand, American Private Collection, New York, collected by Léon Guébels a.k.a. Olivier de Bouveignes between 1913-1918, Willy Mestach, Merton Simpson,9 (above, centre left). Stool, Seattle Art Museum, Inv. N° 81.17.876, collected by Lieutenant Roger Castiau, a Belgian pilot based at M’Toa (just north of Kalemie) between April 1st and July 23 1916,10 (Fig. 6 below). Stool, University Museum of Archaeology and Anthropology, University of Pennsylvania, Philadelphia, Inv. N° AF5121, purchased from French dealer Charles Vignier in Paris in 1919,11 (Fig. 7 below). Bowstand, from the André Lefèvre and René Mendès-France collection, acquired prior to May 1931, (the present lot, above, one from left). Bowstand, Frankfurt Museum des Weltkulturen, inv. N° NS.33.8.34, formerly A. Siffert Collection, Gent, acquired prior to 1937,12 (Fig. 5 below). 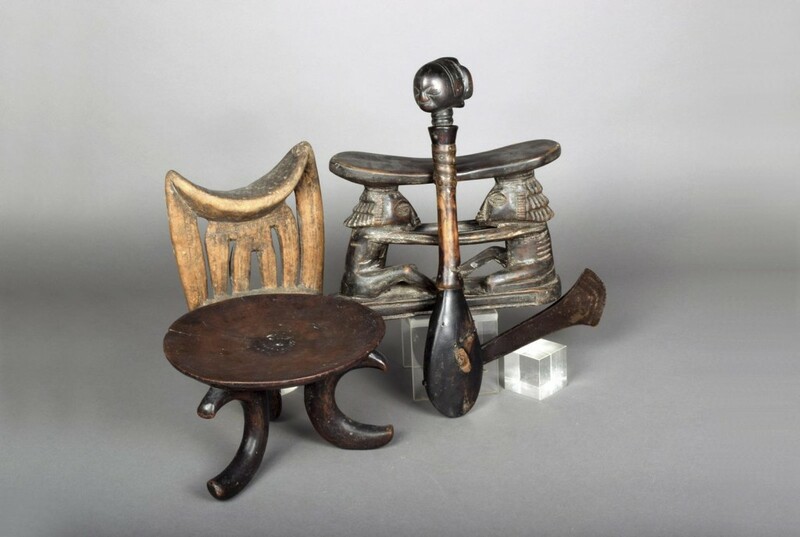 Bowstand, Malcolm Collection, collected in situ by Pierre Wustfeld in 1956, (above, centre right). 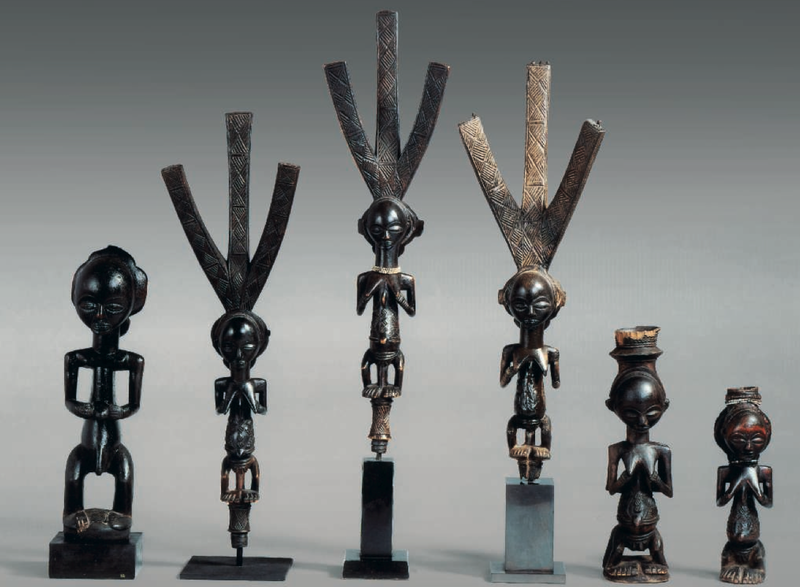 Statuette, former Comte B. de Grunne Collection, sold by Pierre Dartevelle, 1975, noted as coming from Kiambi (above, far left). 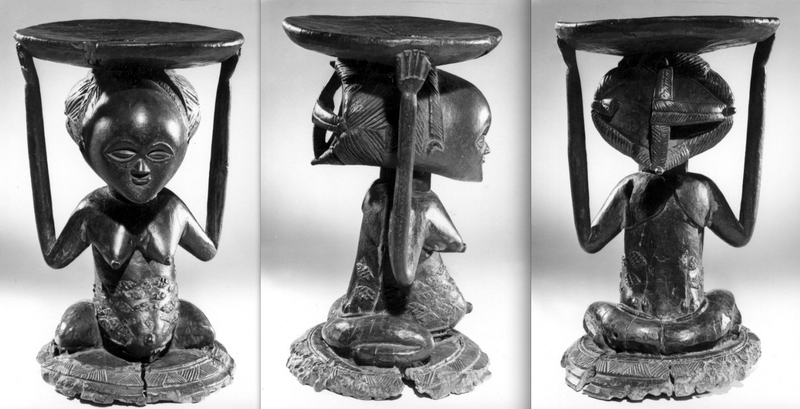 ps it is interesting to find this bowstand being offered by Christie’s. Only last year, it was exhibited by Entwistle at TEFAF Maastricht (info). Note that the excellent sleuthing of Bernard de Grunne in the current catalogue note shows that this object never belonged to Georges de Miré. The erroneous de Miré provenance was added in the entry of the Sotheby’s catalogue in 1980 and has been repeated ever since. 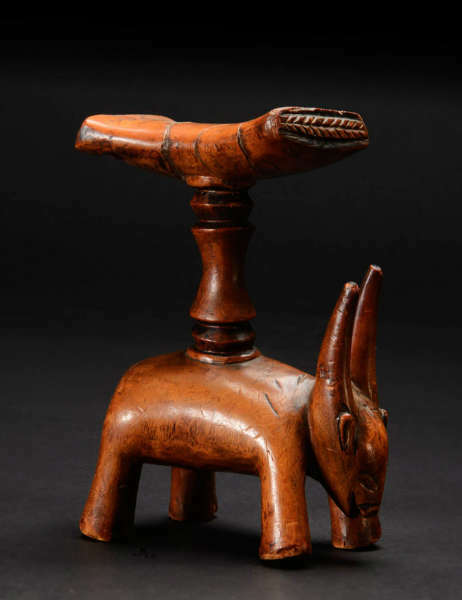 Part of the confusion stems from the fact that de Miré did indeed consign some Oceanic objects from his collection to this 6 May 1931 auction (which included this bowstand). However, Georges de Miré’s African collection was sold six months later on 16 December 1931. At the May sale, the bowstand was consigned by another well-known collector, André Léfèvre. This entry was posted in Auctions, News, Research and tagged Luba on June 15, 2015 by admin. The tangent connecting the upmost point of the eyebrows is a horizontal line dividing the face from the apex of the forehead to the chin into two exact halves (see the below drawing). 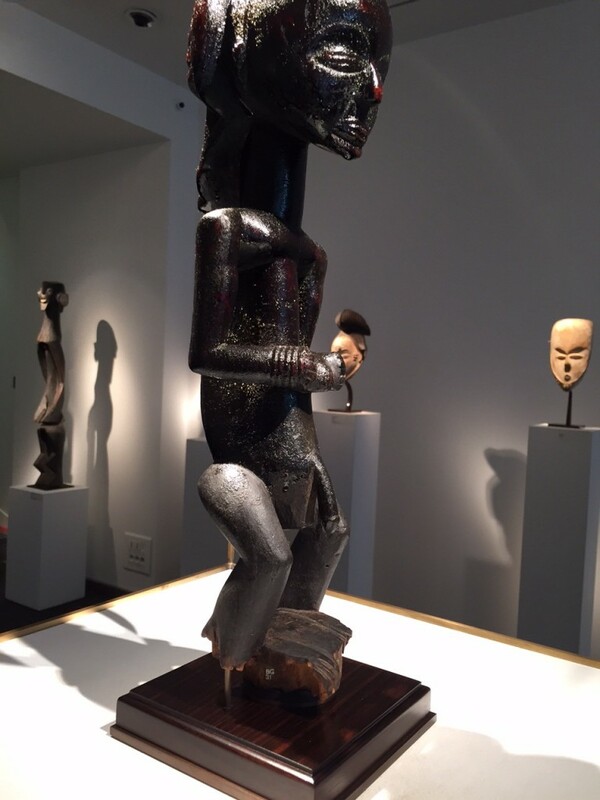 While the upper half is plain, featuring only the forehead, the lower half is visually dense as it contains all facial features – the Warua Master uses the juxtaposition of visual void and density to create tension. Furthermore, the face is inscribed into a perfect ellipse of vertical orientation. The upper half of the ellipse follows exactly the outline of the forehead from its apex to about the line dividing the face into upper and lower half. In the lower half the outline of the face withdraws subtly to the inside. However, it is the lowest point of the beard that falls with mathematical precision onto the nadir of the ellipse. Inside the face, eyebrows and jawbones create two nearly elliptical shapes of horizontal position which follow the same length and width ratio as the vertical ellipse into which the face is inscribed. In light of these strong inherent tensions it is surprising that the face overall exudes so much tranquility and serenity. How does the artist do this? The answer has to do with the position of the eyes and is mesmerizingly mathematical (see below drawing): inscribed in the two smaller, horizontally positioned quasi-ellipses are laterally wide and medially narrow eyes. The virtual horizontal line connecting their inner corners of these eyes (i.e., running right through their middle) bisects the length of the face such that the distance from this line to the bottom of the neck is equal to the distance from this line to the top of the forehead, is equal to the distance between the outer points of the two horizontal quasi-ellipses. We may define this distance as b. However, it is the relation of the lowest point of the beard to the virtual line connecting the eyes that renders the composition in such “perfect balance”. We may define this distance as a. 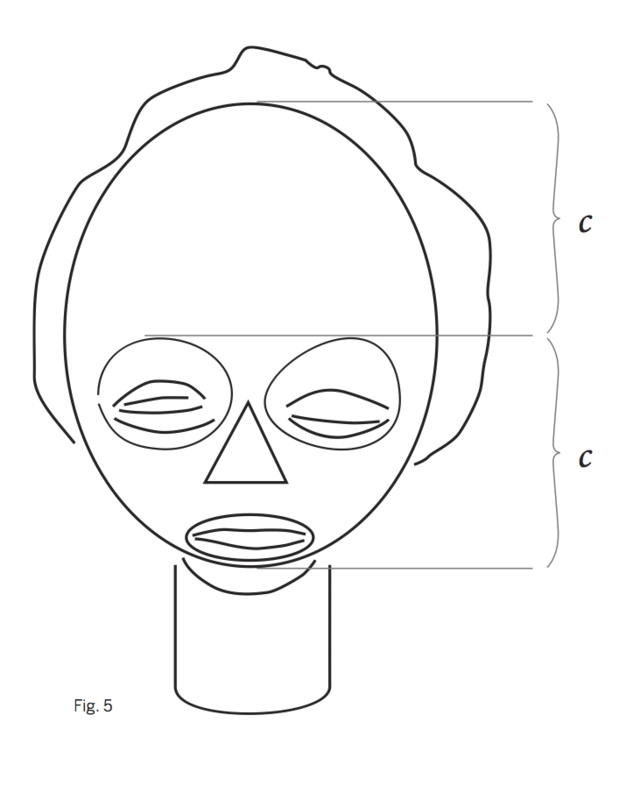 As shown, a and b are measures relating the apex and nadir of the vertical ellipse defining the face to the virtual line connecting the eyes. The ratio of the distances measured by a and b corresponds to a formula which is well-known in aesthetic studies and art history as the golden ratio of proportion. It has been observed in ancient Egyptian sculpture, Greek architecture, early medieval painting and was propagated widely during the Italian Renaissance, most famously in Leonardo da Vinci’s Vitruvian Man (1492) as manifestation of the divine spark visible in the greatest masterpieces of creation. This ideal proportion is mathematically defined by an irrational number that is approximately 1.618 and most often replaced by the Greek letter Φ. As the drawings and the above show, a number of the aesthetic choices made by the Warua Master follow the golden ratio with an uncanny mathematical precision – although we don’t know whether this is a result of intuition or calculation. To my knowledge (and do correct me if I’m wrong*), this is the first time the golden ratio has been applied in the analysis of an African art object. I’m confident that once you start looking you can find it in a lot of other objects too. 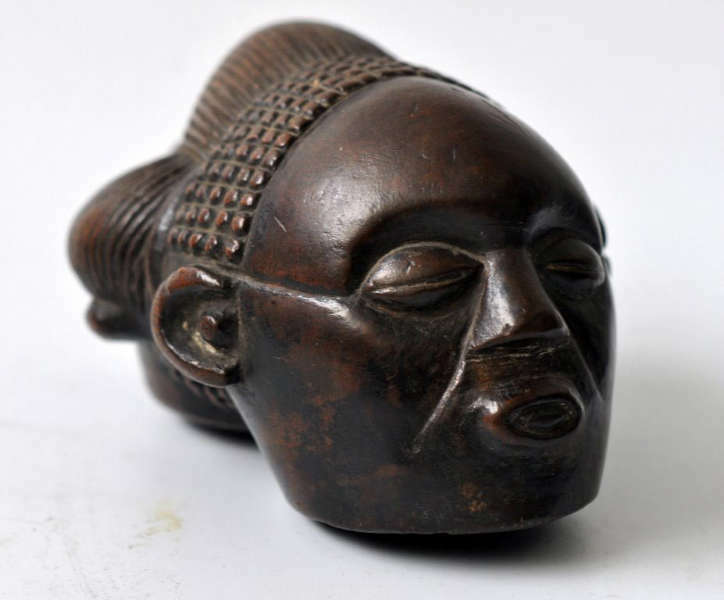 For example, have a look at this Mende mask in the same catalogue. It is possible to see the golden ratio in anything, really. 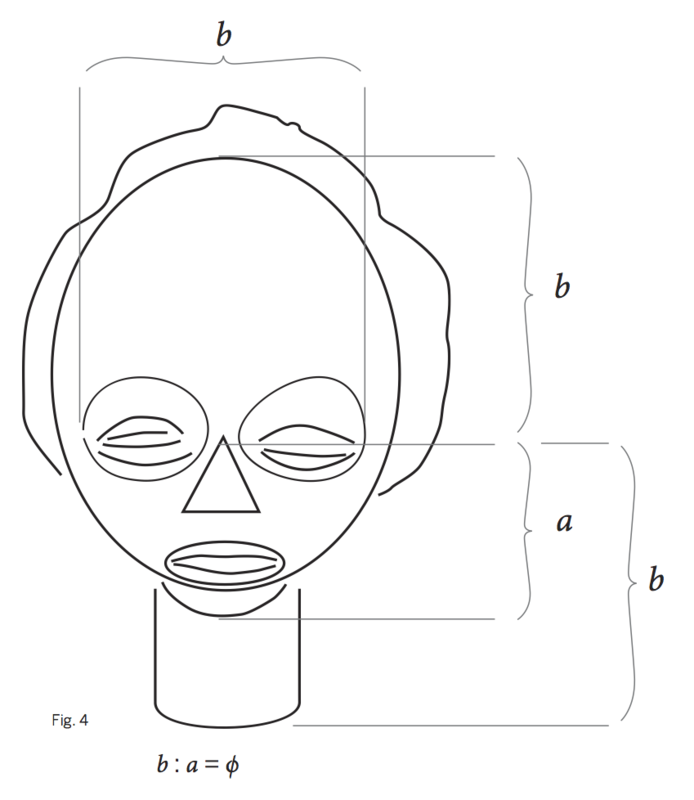 While the relation between the golden ratio and aesthetics remains highly debated in academic circles (for example here), this analysis certainly helps to better understand and appreciate the beauty of this Luba figure, or African art in general. 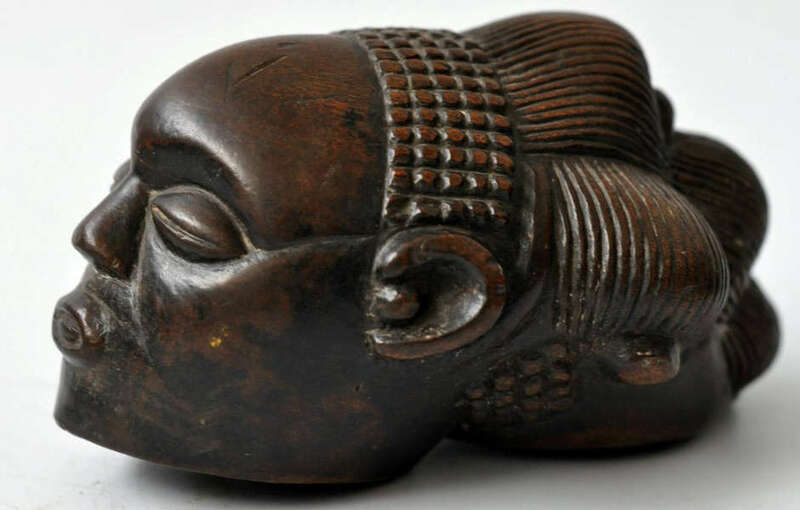 *UPDATE: a reader informed me about Jean-Pierre Fournier’s analysis of an Akan comb (“Le peigne ashanti et ses mystères”), published Arts d’Afrique Noire” in 1985 (no. 56, pp. 11-14), where Fournier applies the section dorée and rectangle d’or to a comb from his collection. This entry was posted in Auctions, Opinions, Research and tagged Luba on April 29, 2015 by admin. So petrified have become the customs of the present in the traditions of the past, that we have known women to go two days journey to see the stool of the chief at Nkulu, that they might settle some little matter as to the correct vogue in cicatrization marks. This stool, carved at least 150 years ago, still sets the fashion, to certain of the Luba in cicatrization. 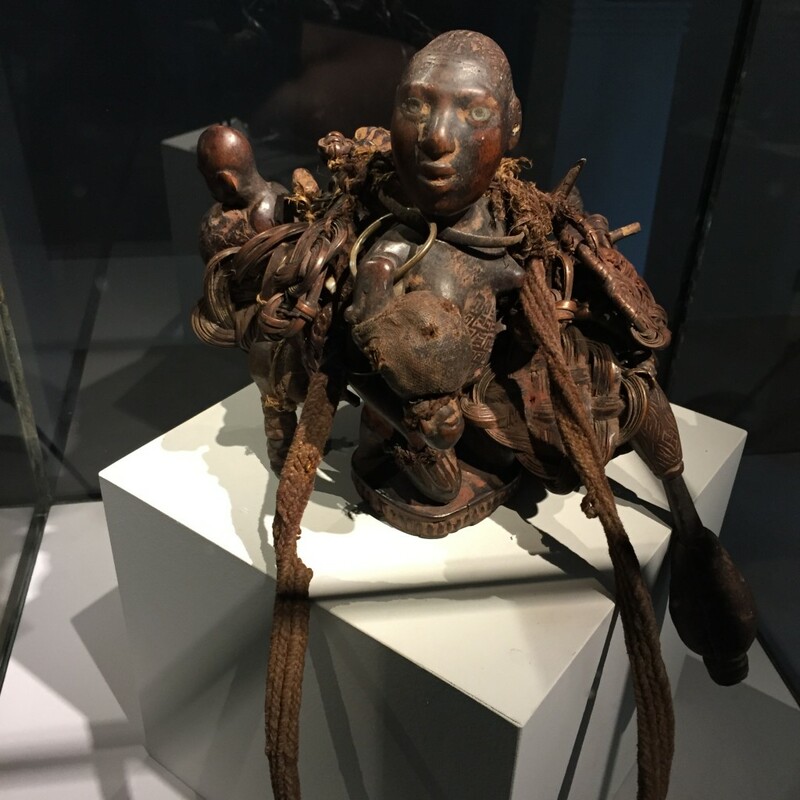 Burton’s observations are important in that they suggest that, not only did the artists who made the Luba stools copied actual hair and scarification styles, but also that they set a standard of fashion for succeeding generations. 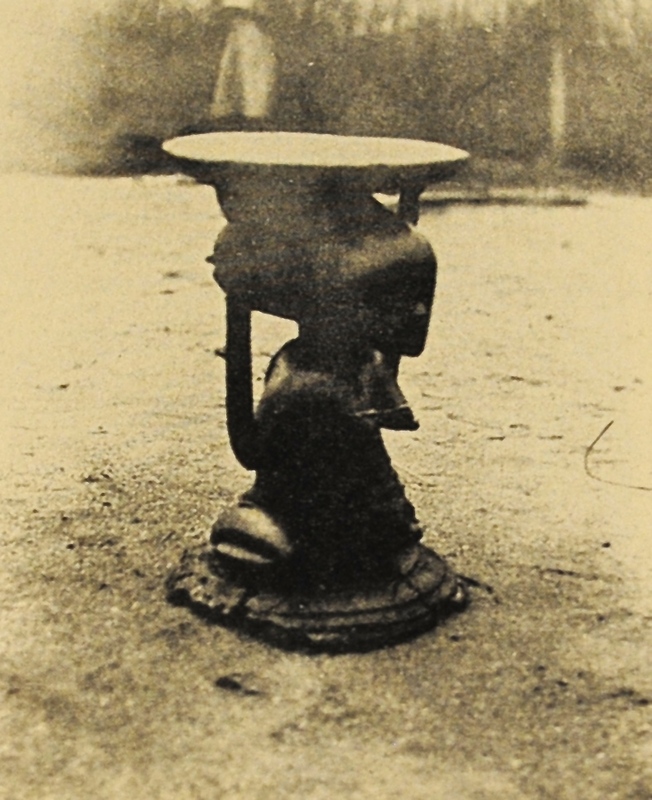 Note that well known is that Burton also photographed this stool in the 1920s, as illustrated above. Unfortunately the details of this field-photo are not very clear – which might explain why this picture hasn’t been published much. However, after some sleuthing I was able to track down this stool (which fortunately survived time) and we now can finally see the cicatrization patterns in detail (click on the picture to zoom). This stool was sold by Sotheby’s London on 17 June 1991 (lot 150); the Belgian dealer/collector who bought it for £ 63,800 presumably being aware of its importance. Interestingly enough, Burton’s original caption accompanying this field-photo stated: “Stool of office of Nkulu chiefs, 250 years old. Insignia of office carried even in war”. Especially the supposed age of this stool is remarkable; Burton’s informants stating it was made in the 18th century. This shows that many Luba regalia may in fact be much older than we think. This entry was posted in Discoveries, Objects, Research and tagged Luba on March 25, 2015 by admin. 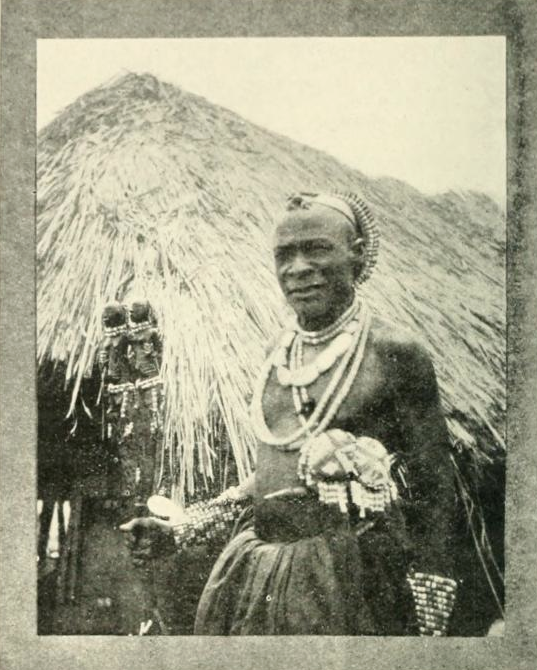 While researching an important Luba object, I came across this amazing field-photo of a Luba chief in the 1922 book Missionary pioneering in Congo forests: a narrative of the labours of William F.P. Burton and his companions in the native villages of Luba-Land” (p. 196). The old chief Kilulwe came to meet us in the most extra-ordinary get up. He had a sort of halo round his head made of blue, black, and white beads, a similar bead-covered insignia across his breast, a very keen, well-made Luba knife stuck into his belt, a beautiful little leopard skin around his loins, and most extraordinary of all, an elaborately carved staff in his hand, on the head of which were artistically carved two Luba women arm in arm. 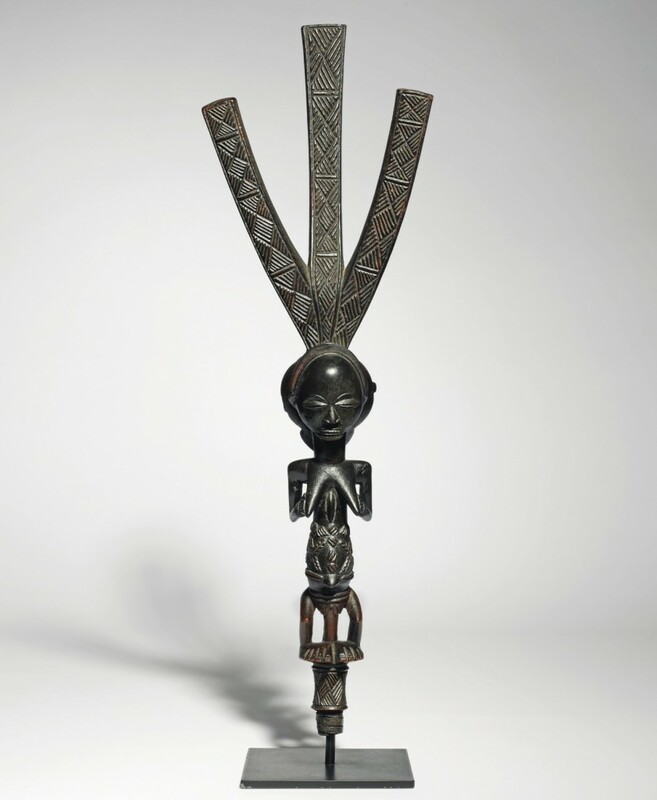 I did some research and was able to track down this staff; it is now in the collection of the Seattle Art Museum. Luba staff. Height: 104 cm. Image courtesy of the Seattle Art Museum. By the afternoon, the chief, who had become offended, had recovered from his sulks and attended the Gospel with a big following, though his whole attitude was that of graciously condescending to patronize our meeting with his august presence; and I fear that he will have to bend his bead-crowned head considerably lower before he can enter the strait gate of Salvation through repentance toward God and faith in the Lord Jesus Christ. the founding of the Luba kingdom and the original culture hero’s identity as a master blacksmith, it is not surprising that a chief would also by be an artist. 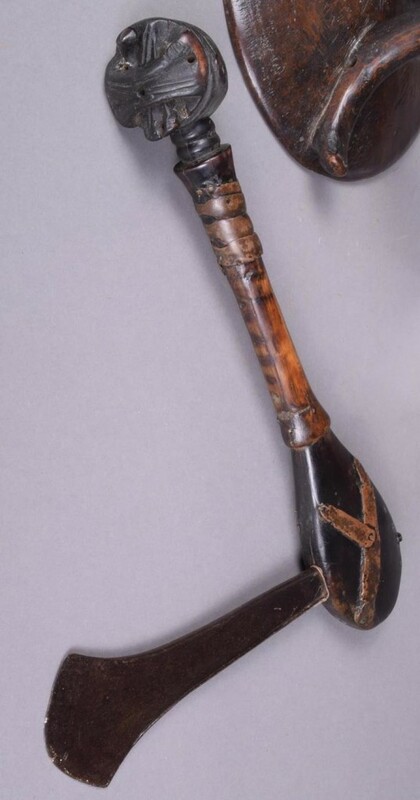 So possibly it was Chief Twito Kilulwe himself who carved this remarkable staff. This entry was posted in Research and tagged Field-photo, Luba on March 16, 2015 by admin. 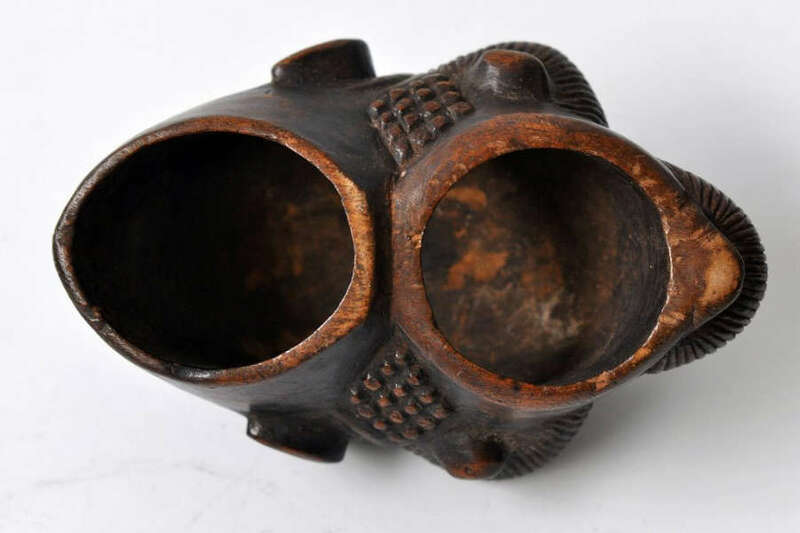 Luba cups of this sort were documented by the late Albert Maesen, former Head of the Ethnography Section at the Royal Museum of Central Africa in Tervuren, who conducted research and a collecting mission in southern Belgian Congo in the 1950s. Maesen reports that among the Kanyok, royal drinking vessels were the only objects he was not permitted to see in a storeroom in which the ruler’s emblems were guarded, including thrones and scepters. He was allowed to view the rectangular box in which the cups were kept, but he was informed that they were only used during a ruler’s investiture and for other sacred occasions (A. Maesen, personal communication, 1987). Maesen found that royal cups called musenge were also used in a ceremony to honor paternal ancestral spirits, when a titleholder made an offering of cooked cassava while the ruler communed with his ancestors. The chief counselor named Shinga Hemb drank palm wine from one side of the cup and then passed it to the participants who drank from the other side. Similar acts were performed after divination or at the rising of a new moon (A. Maesen, personal communication, 1982). The secrecy associated with these royal cups and their limited number suggests another possible association: Early colonial sources and oral traditions point to the importance of the skull of the previous ruler to the investiture of his successor. The skull was the vehicle through which the new ruler obtained power, blessing, and wisdom from his predecessor and validated his own link in the chain of political and moral authority. Quiet contemplation with the skull was essential to investiture, and some writers assert that the king consumed human blood from the cranium, to effect his transformation from an ordinary human being to a semi-divine ruler (Verbeke 1937: 59; Van Avermaet and Mbuya 1954: 709-711; Theuws 1962:216). Indeed, the Luba word for royalty, bulopwe,” refers to “the status of the blood” (Roberts and Roberts 2007:32). It has been asserted that carved wooden cups might have replaced and symbolized the use of skulls in important rituals (Huguette Van Geluwe, personal communication, 1982). Such an assertion remains a hypothetical explanation for the existence of these beautifully carved and carefully concealed cups. This entry was posted in Auctions, Discoveries, Objects and tagged Luba on April 24, 2014 by admin. 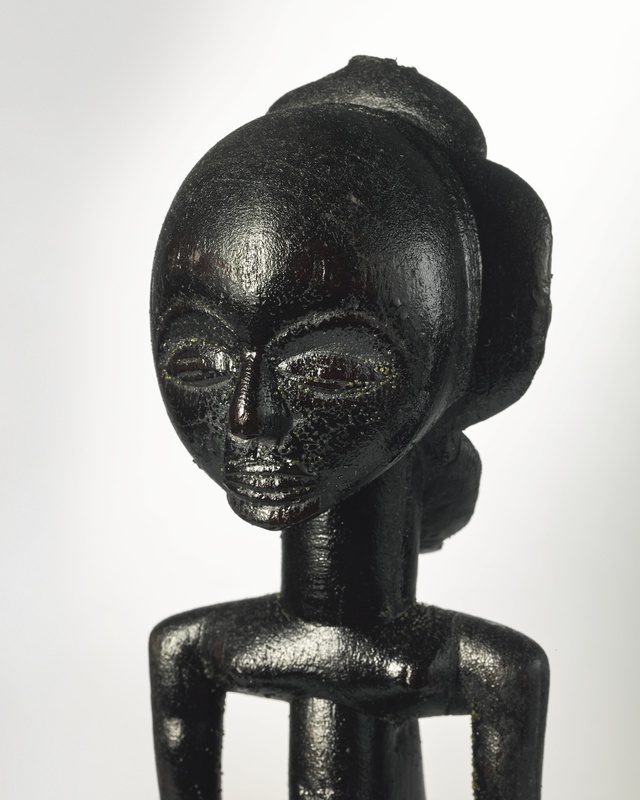 A Luba Shankadi mboko figure. Ca. 1930. Height: 59 cm. 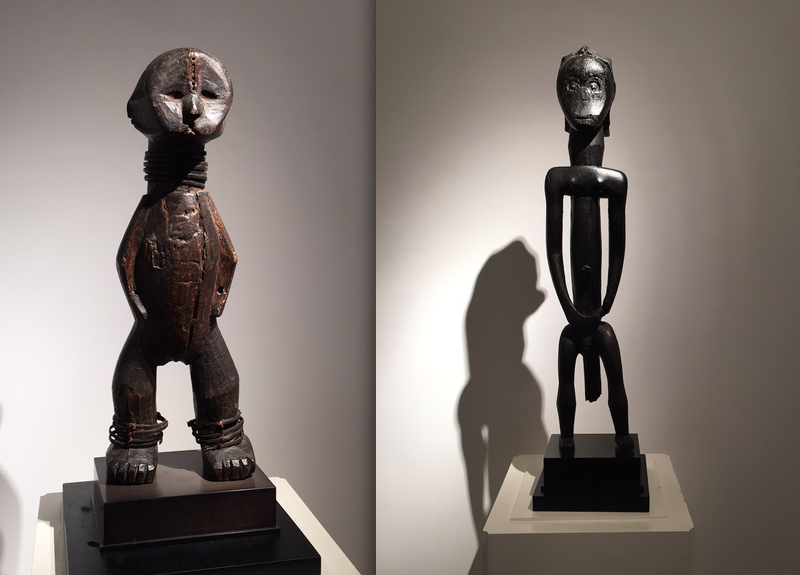 Earlier this month the Colin Sayers collection of African art was auctioned by Stephan Welz & Co. in Cape Town. You can read a tribute to the man here. The above Luba bowl bearer was the top lot of the sale and sold for € 18,000 (including premium). 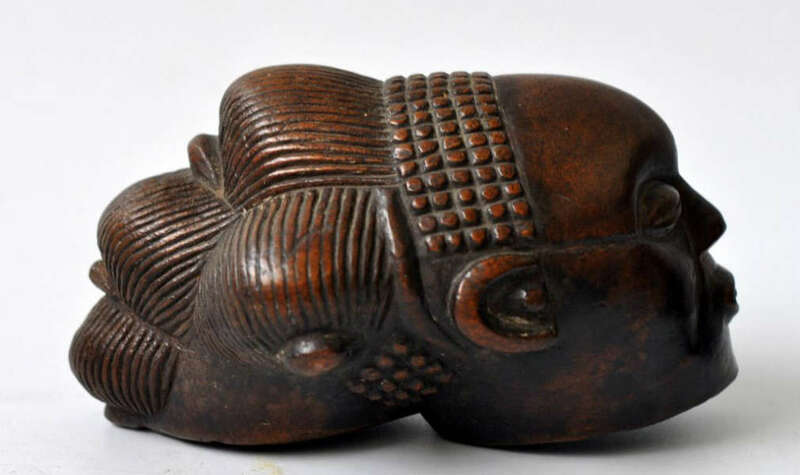 Most likely it was carved by by Kitwa Biseke, official carver to the Nkulu chieftainship (Mwanzi region). Many mboko from this workshop are known, but this one was a new addition to the corpus. 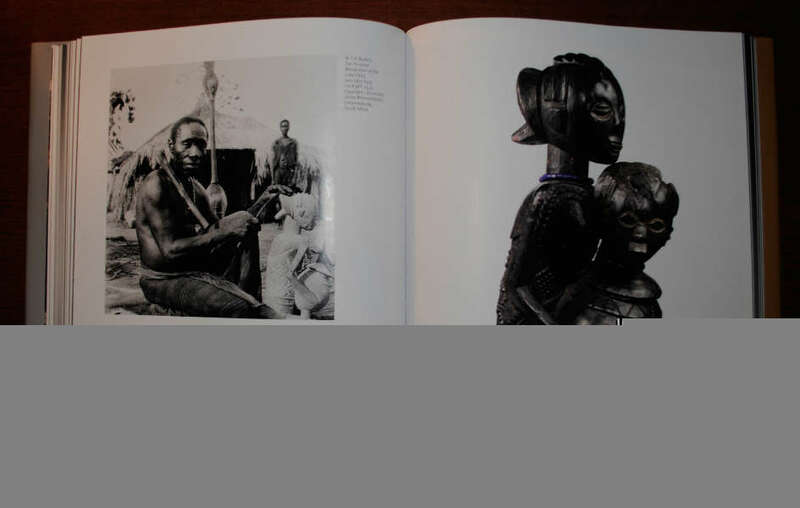 More info can be found in an article by A. Nettleton: Burton’s Luba Mboko: Reflections of Reality, The Collection of WFP Burton (University of the Witwatersrand Art Galleries, Johannesburg, 1992, pp 51-67). Below another mboko from this workshop published in African Fetishes and Ancestral Objects, together with a field-photo of the carver in action by Burton – click on the picture to zoom. This entry was posted in Auctions, Collectors, Objects and tagged Luba on March 12, 2014 by admin. “It’s not what you say, but how you say it” has always been a popular marketing phrase. One dealer who’s very aware of this, is the Brussels based Didier Claes. 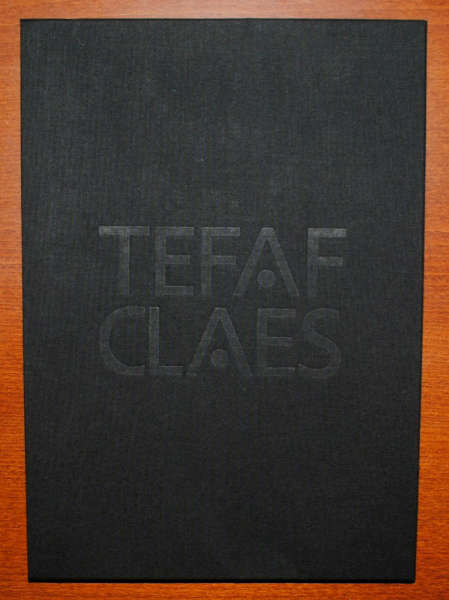 Today, I received the catalogue for his exhibition at TEFAF. It was packaged in a very fancy black bubble wrap envelope. Once again, Claes is raising the bar for his fellow dealers. 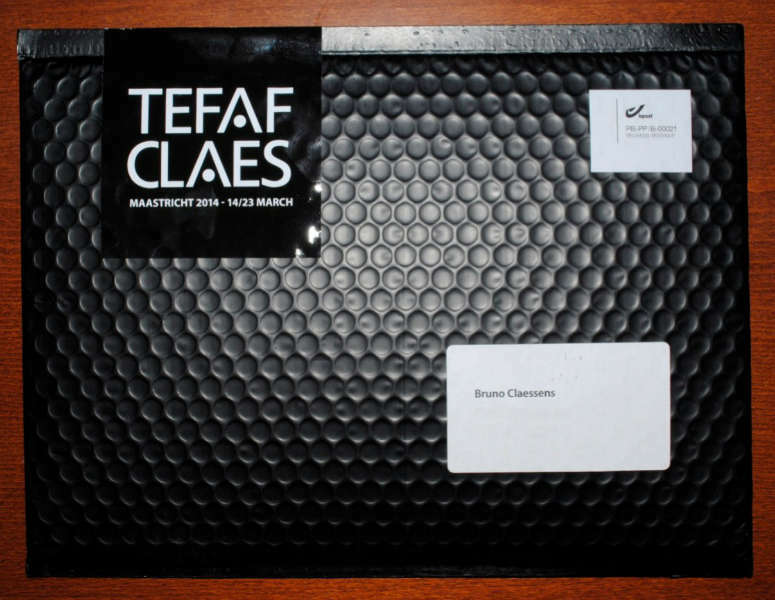 Participating as a full member of Tefaf for the first time*, a statement had to be made of course. 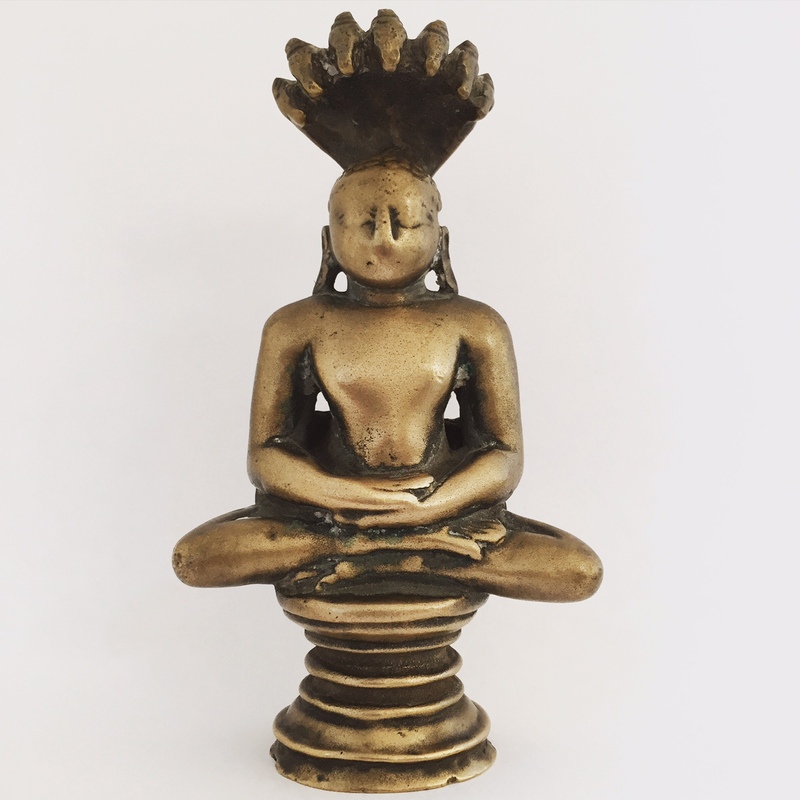 Inserted in a luxurious slipcase, the catalogue presents 24 carefully selected objects – my favourite being the superb Luba caryatid stool illustrated below. Talking about Tefaf-quality! The book features texts by Agnès Lacaille, Marc L. Felix, François Neyt, Manuel Jordan, Louis Perrois and yours truly. *In 2008, he had already participated as part of Tefaf’s showcase program. UPDATE: you can download the French edition of the catalogue here. This entry was posted in Fairs, Publications and tagged Luba on March 7, 2014 by admin. Last Saturday, 14 December 2013, Artcurial Lyon, auctioned the collection of the anonymous Mr. C. You can download the catalogue here. Though mostly utilitarian objects, the sale contained some interesting items. The sleeper of the sale, the above Luba antelope headrest (info), estimated € 2K-3K, sold for € 26K (without costs). An old inscription mentioned it was collected in 1914. 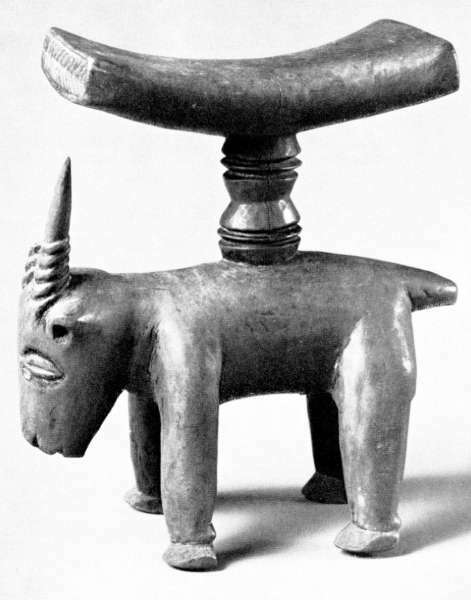 Compare it with a similar neckrest, illustrated below, from the Ethnologisches Museum in Berlin (#III.E.12755), collected in 1907 (height: 14,8 cm). Again, this result illustrates, that no masterpieces in small auctions stay overlooked these days. Be it in Liège, Belgium; Lyon, France or a small provincial sale in the UK, the time of being the only knowledgable person at such a sale is definitely over. Secondly, since there were not many other suprises in the sale, it shows also how highly selective the market is these days. In this economy, everybody is watching his or her cash more carefully than ever and only the safe bets still generate interest. Image courtesy of SMPK, Berlin. This entry was posted in Auctions, News, Objects and tagged Luba on December 16, 2013 by admin.